What does the timeline look like, assuming that whichever chamber passes it first passes a "clean" bill? Is either chamber likely to meet this weekend to try and pass something? If all parties do agree on the CR, what is the soonest that it goes into effect? When would federal employees need to return to work? Both the House and the Senate have passed two bills that when combined reopen the quarter of the government that was shutdown. H.J.Res.31 - Making further continuing appropriations for the Department of Homeland Security for fiscal year 2019, and for other purposes. Adopted by Voice Vote: H.J. Res. 28, as amended (Short term CR through February 15th) and H.J. Res. 31, as amended (sends DHS Appropriations to Conference and authorizes the appointment of Conferees). The final text of the House joint resolutions and the roll call votes are still not available as of now. 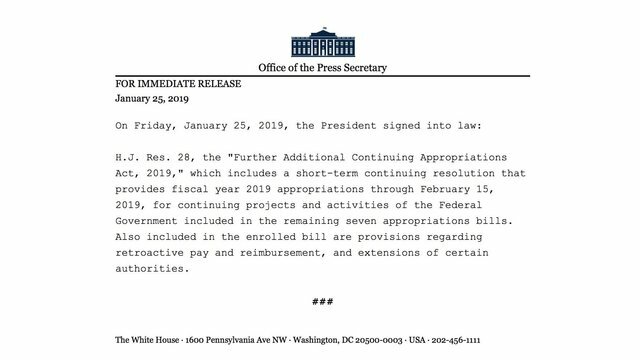 The government will reopen as soon as President Trump signs both bills into law. According to media reports, he’s expected to sign them tonight. President Trump has signed H.J.Res.28 into law, per a press release from the White House. Well, the Senate just passed it, https://www.c-span.org/video/?c4776554/senate-unanimously-approves-deal-open-government so I imagine it'll happen at some point tonight. Not the answer you're looking for? Browse other questions tagged united-states government-shutdown or ask your own question. Could state or federal agencies purchase “government shutdown insurance” if it was available? Are US politicians still paid a salary when they cause a government shutdown? Why is the looming shutdown of the US federal government not avoided by “reconciliation”? How long can a president keep a government shutdown?